So you’ve got your outfit, found the perfect shoes and booked your mendhi artist. The only task left is to find flawless bridal jewellery to complete your look; the proverbial icing on the cake. Whether you want a traditional set for your religious ceremony or something totally bespoke, Mumtaz Collection in Birmingham, home of the jewellery quarter, has a selection of uniquely one-off accessories that can’t fail to leave you feeling like a million dollars. 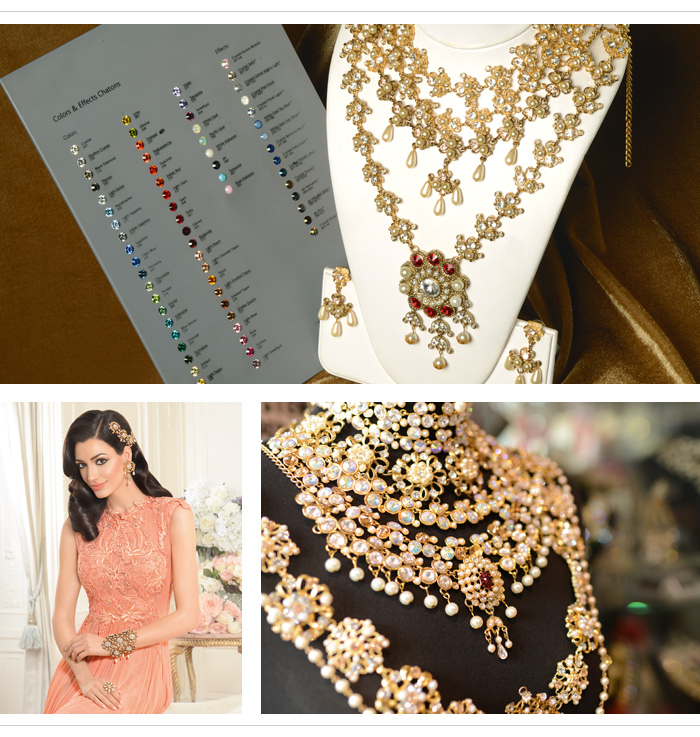 All the pieces in the Mumtaz Collection boutique are designed by the store. The sheer scale of choice means that there is something for everyone, no matter your style preferences or special occasion. Pieces can be plated in silver or gold or antique versions of both. Many clients adore the black plating which offers a gothic twist for evening wear jewellery pieces. Choose to have Swarovski crystals, pearls, beads or other finishes to give your jewels the personal touch. As well as creating custom-made bridal pieces, Mumtaz Jewellers, stocks a range of jewellery and ornaments for other special occasions – perfect for wearing to any engagements or weddings you may attend this summer. The boutique showcases spectacular belts, collar pieces, shoulder pieces and other party wear. Mumtaz Collection’s devotion to keeping an eye on current trends teamed with their dedication to creating high-quality luxury jewellery means that there is something for all the family. Mumtaz Collection offers a variety of magnificent pieces perfect for the bride who wants distinctive pieces to wear and keep as heirlooms after her wedding day. Robina from Mumtaz Collection suggests bringing in your lengha or outfit to the store so that they can create a piece that compliments your overall look without being overwhelming. Exquisite earring and necklace sets in vintage styles, extravagant jhummars or delicate tikkas all sparkle behind display cases, hinting at what your bespoke piece might look like. Men’s jewellery doesn’t get as much attention as it should, but with Mumtaz Collections huge selection, your groom won’t fail to turn heads. The jewellery doesn’t have to be over the top pieces if that’s not their style. Think refined tiepins, custom-made cufflinks or elegant pearl broaches for the sherwani or turban. All ornaments are made with the customer in mind.